We are very proud to announce that the Orange County Medical Association (OCMA) has recognized Dr. Semira Bayati, for the second year in a row, as 2019 Physician of Excellence in the specialty of Plastic Surgery. In addition, Dr. Bayati will be included in Orange Coast magazine’s 2019 Top Doctors list! These honors are particularly special for Dr. Bayati, as they are based on the feedback and opinions of her colleagues and her patients. 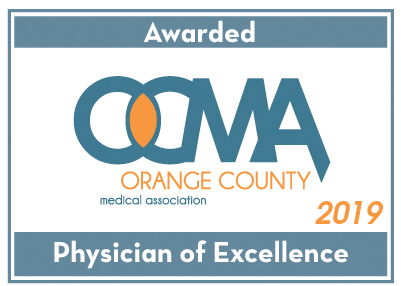 This makes the third time Dr. Bayati has earned the OCMA Physician of Excellence award. The honor is bestowed upon physicians by fellow medical professionals who believe they are exceptional in their fields, as well as by patients who feel they have obtained outstanding results from surgery performed by the physician. Dr. Bayati was recognized as an OCMA Physician of Excellence in 2016 and 2018, and will receive her latest award at a formal banquet scheduled on January, 23rd. If that isn’t already a good start to the new year, we are equally excited about Dr. Bayati’s recognition as a Top Doctor in Orange Coast magazine. The publication’s annual list is a way for people in the Newport Beach and Orange County community to find respected and reputable physicians in the region. Dr. Bayati is deeply honored to once again be named a Top Doctor in our area, and looks forward to helping more and more patients achieve their aesthetic enhancement goals throughout the new year! If you would like to schedule a consultation with our board-certified plastic surgeon, or if you would like more information on available treatments, please contact us today.